I’m rather slow to learn some lessons in life and as a wife. One of the things I wish I had realized earlier is that it is entirely too easy for a mom to get so focused on nurturing her children that she subconsciously pushes her husband aside. In fact, in my first marriage, I remember thinking to myself…”My husband is an adult so he can take care of himself. It’s my kids who really need my attention.” Not good thinking! One of the casualties of this idolizing of our kids is our husbands. The bizarre thing is that the very children we were determined to protect end up severely wounded as mom and dad become distant, begin to argue, and often end up divorcing each other. Don’t let this happen to you. 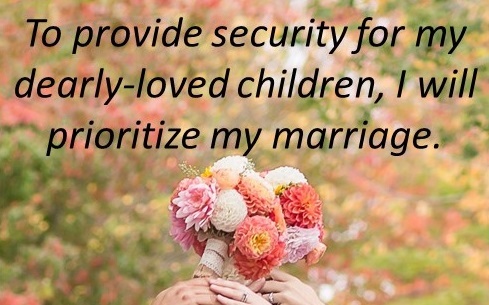 Be intentional about spending quality time with both your husband and your children. Even more important than that, spend quality time with God. He must truly be your number one focus in life!